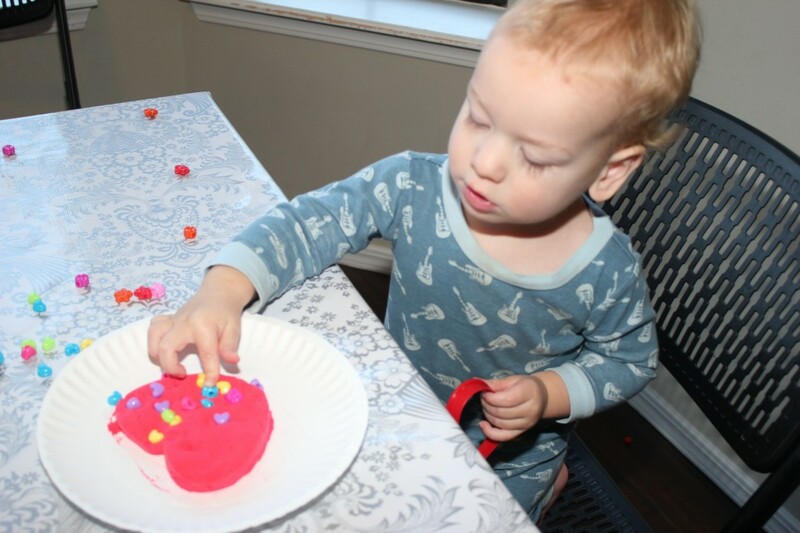 Donovan is 20 Months Old! Donovan has now discovered that asking for books is the perfect way to put off naptime, bedtime, and the easiest way to get a lazy mama out of bed in the morning. He loves the Christmas Parade book, with the drumming elephant, all the llama board books, and books about dinosaurs and dogs. This is how he gives kisses now! I love it! 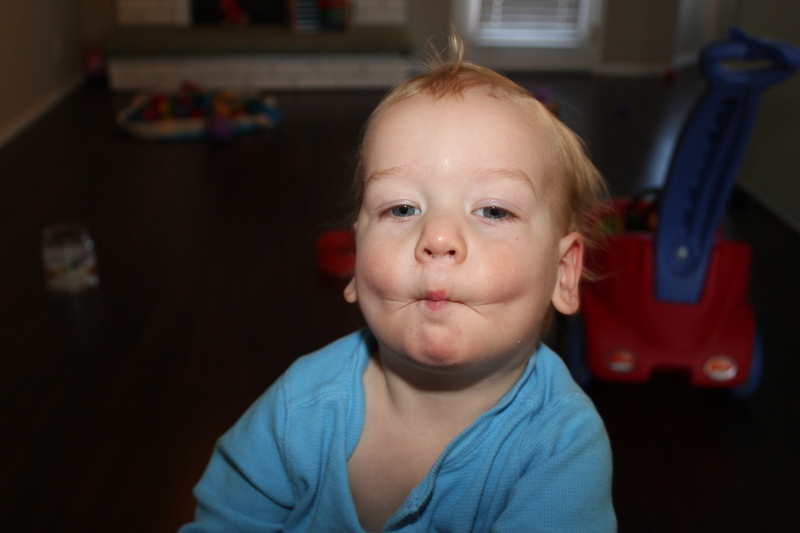 Donovan is nearly 20 months, and he seems so grown up!! He’s talking a lot, playing games that are much more complicated, and having more ideas of his own that he can share. And he’s big! We can go to the indoor playgrounds and he can do basically everything on his own. He is starting to be able to do crafts. 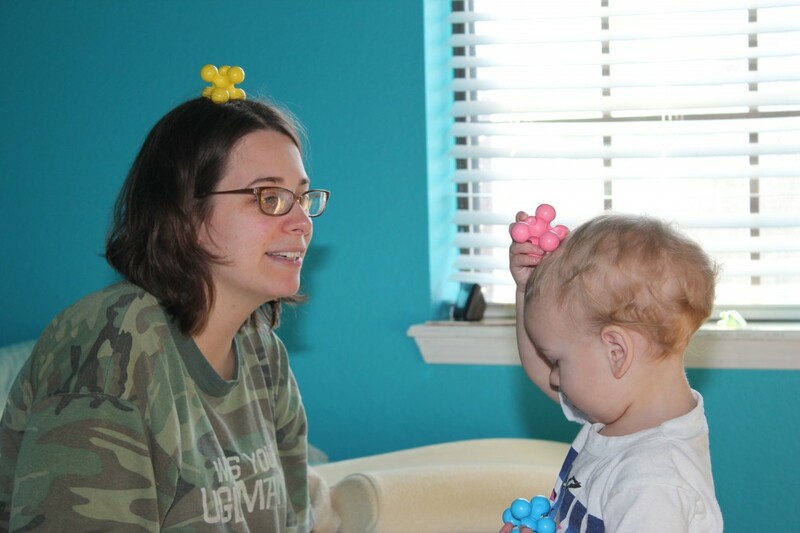 He plays play-doh when Serenity does, although he doesn’t have quite her play-doh attention span yet. I think he likes coloring more. He doesn’t always say the colors right, but he often does, so I’m not sure if he doesn’t really know them or just doesn’t really care about answering Mama’s questions. He seems to prefer purple. He asks for books all day long now, which I absolutely love. 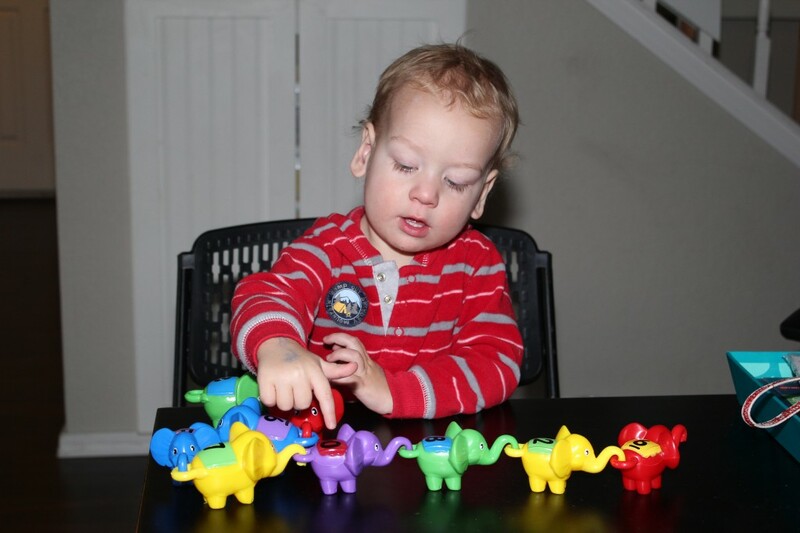 He especially likes dinosaur books, and elephants. We went to the zoo and he asked about elephants the entire time, and was very happy when we got to them. =) He also watched the lions for a long time. It was funny, first Donovan wandered away, then Serenity asked for more lions, and then Serenity wandered away, and Donovan said “More lions!” We had Papa with us at the zoo, which was SO nice. When I took them to the zoo by myself, Donovan decided he didn’t want the stroller, and that he would prefer to walk the opposite direction from Serenity and me whenever possible. The look on his face was pure mischief. I said that day if I ever got a leash for a child, I think it would be him. =) I think he’s starting to get better about holding my hand already. He definitely thinks he should be allowed to walk whenever he wants now though. He loved it when Alli visited us. He calls all big girls Alli now, and can’t be convinced to call them anything else. He does the same thing with Barrett. All cool boys he wants to play with are Barrett. 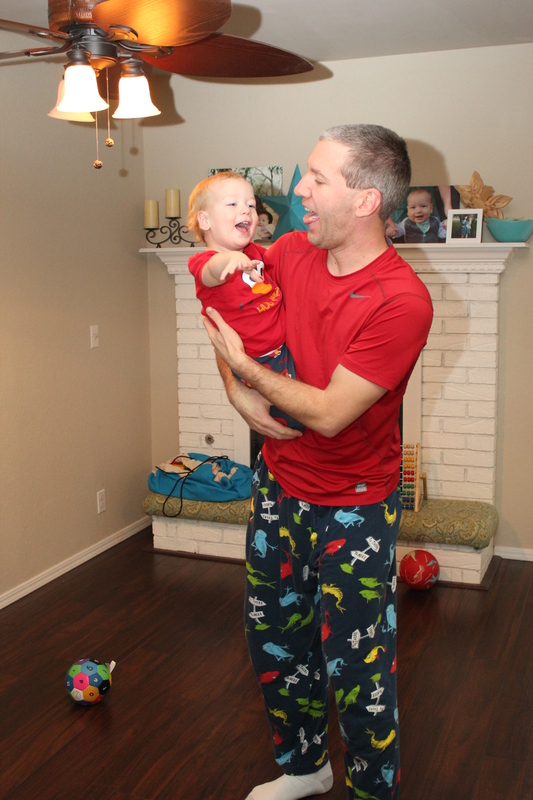 Posted in Uncategorized | Comments Off on Donovan is 20 Months Old! 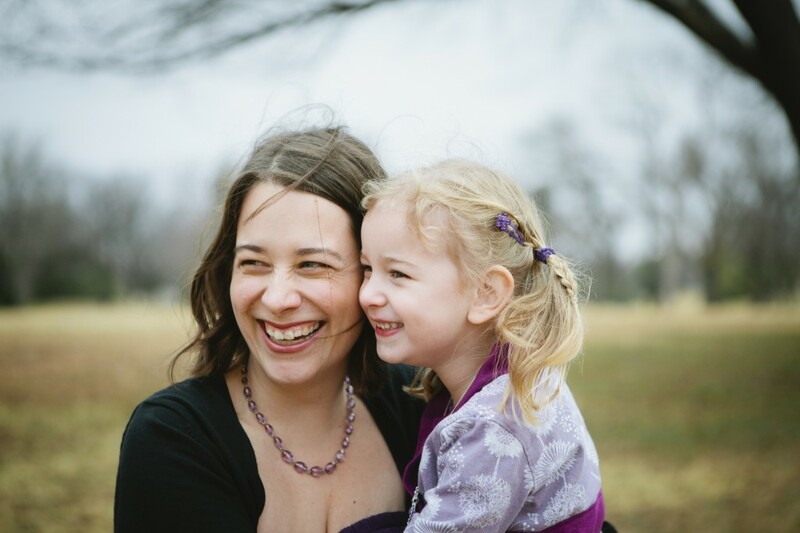 One of my favorite pictures of me and Serenity ever, taken by Heather Warren! I LOVE pretend play. 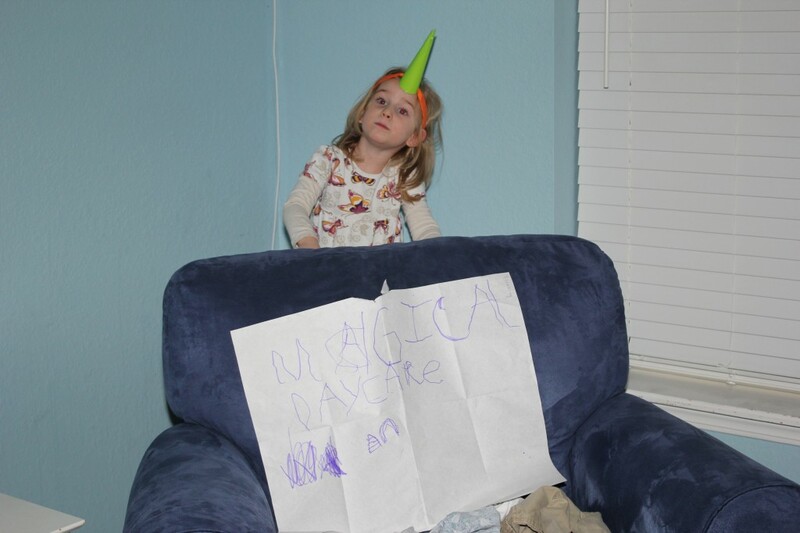 Before Serenity left for school today she created Unicorn Day Care. She put Magical the Unicorn behind my recliner, and made her a bed from leftover batting, collected magical block food for her to eat, and put a brush and water sprayer for grooming in the stable. 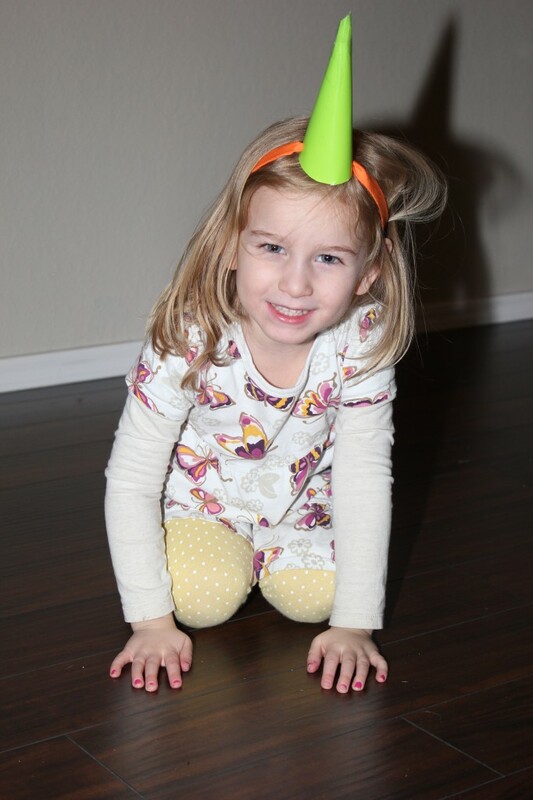 Tonight after we got home she asked to make a unicorn horn out of some poster board she found, and I was the groomer for both unicorns in Magical Day Care. So much fun!!! We’ve started a new tradition that is so exciting. Every Friday this year is going to be Kindness Day. I plan for us to do at least 52 service related activities! Our first Kindness Day was to go through our toys, books and clothes and choose at least one thing from each area to donate to someone who doesn’t have as much as we do. I thought Serenity did a great job of choosing things. She didn’t only choose toys she was done with, she also chose things that she likes. So proud! 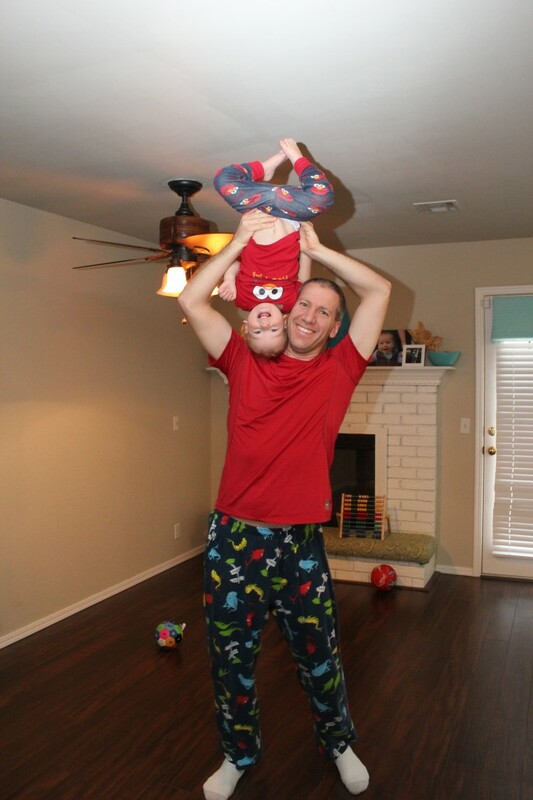 We spend a lot of time these days riding the pillow pets around the house. The kids both share each pet. 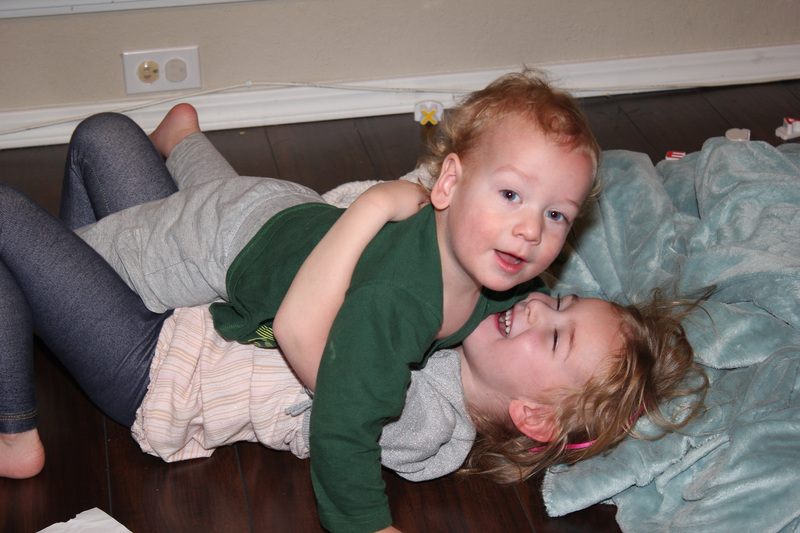 They are so much fun! 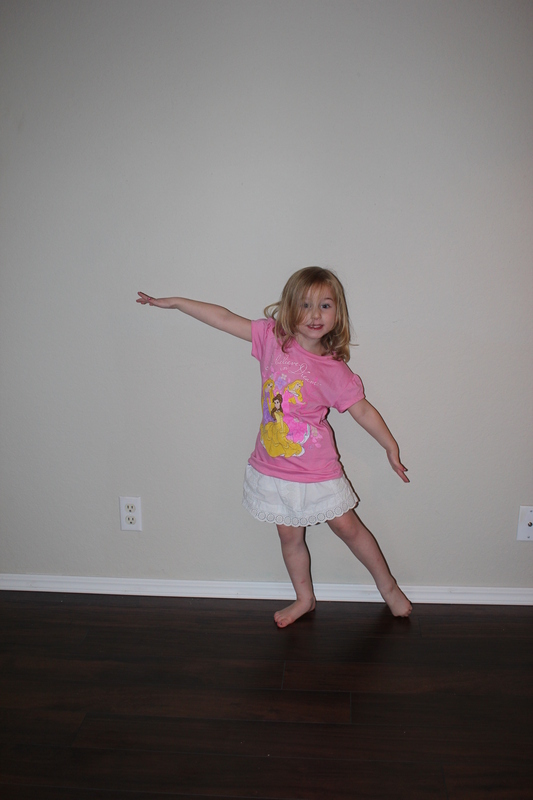 Serenity has gotten to the point that she can fly across the whole room, and sometimes she spins in circles. Jennifer took Serenity and Raegan out for a girl’s day! They went to a salon and got manicures and pedicures. Serenity’s fingers were pink, and her toes were purple. She even got fancy flowers painted on! Jen said she could see Serenity becoming a real manicure junkie =) Then they went shopping! She came home with so many adorable outfits! 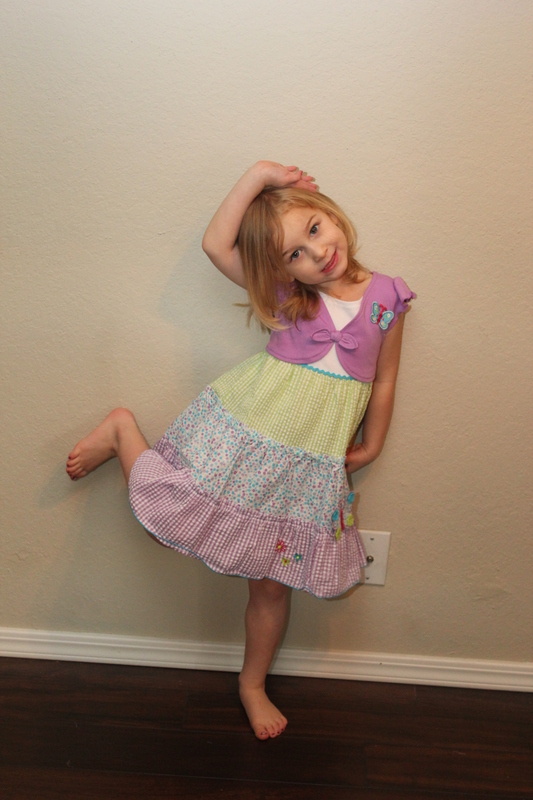 She modeled them all for me, and they were adorable. And I saw all the clothes Raegan got too. 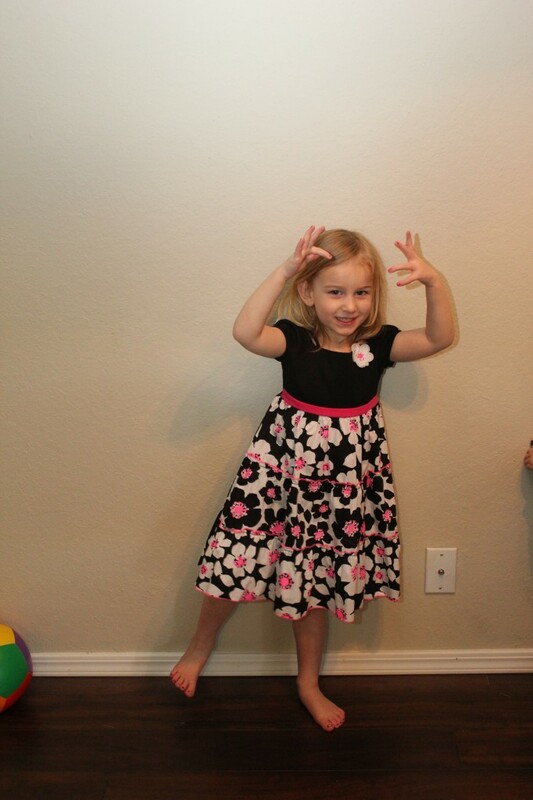 She’ll probably pass some of them to Serenity eventually =) She loved her girl’s day! 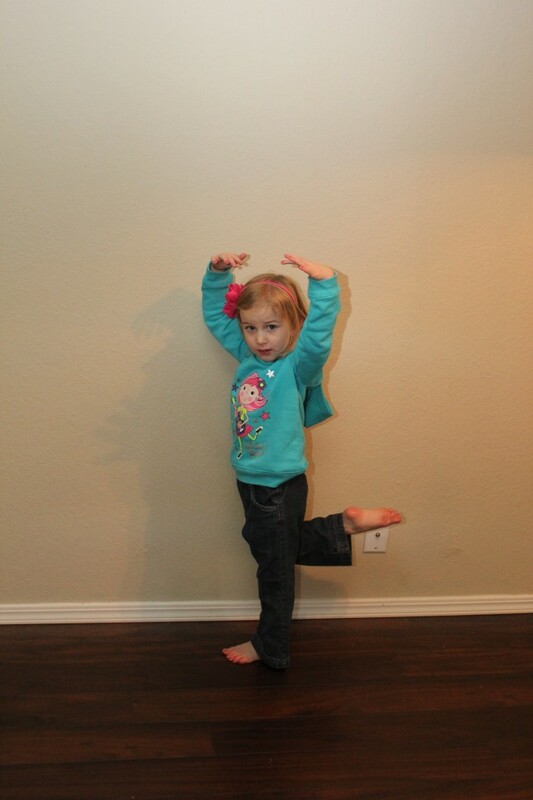 Serenity had quite a fashion show for me =) I love her fancy poses! 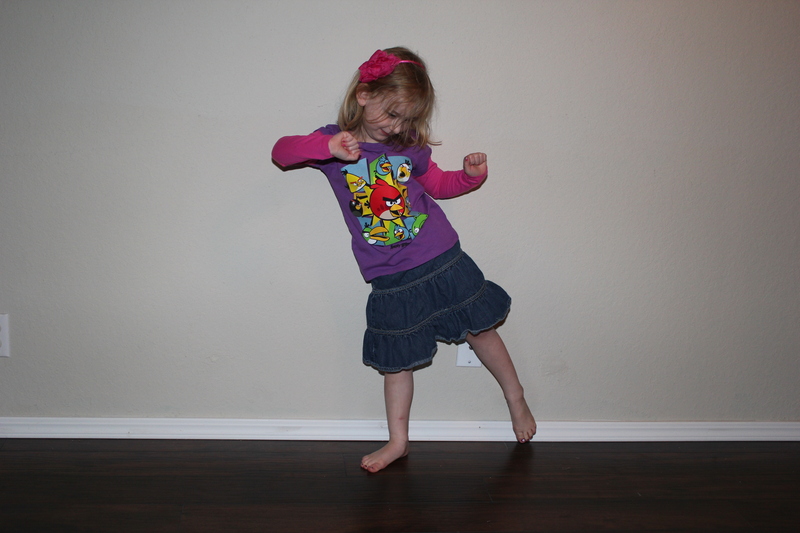 She still loves to twirl and dance around so gracefully. It’s darling. 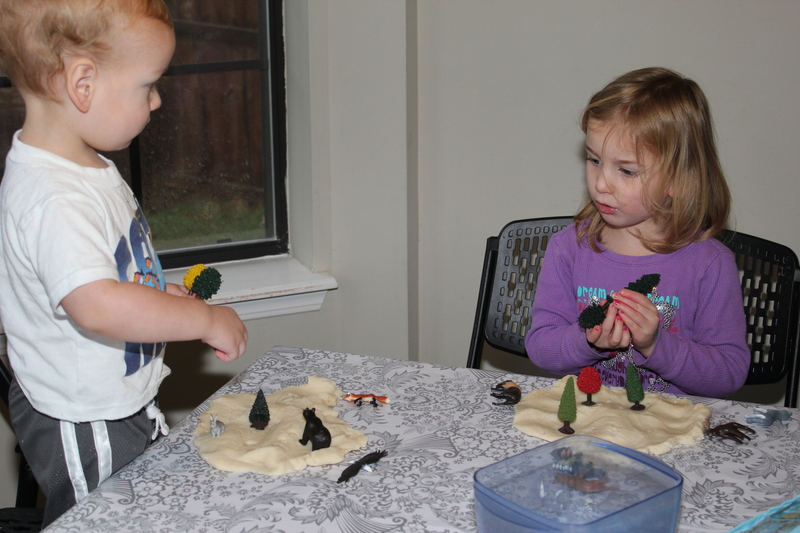 We also had a couple of playdates, first a science playdate with her friend Emerson. 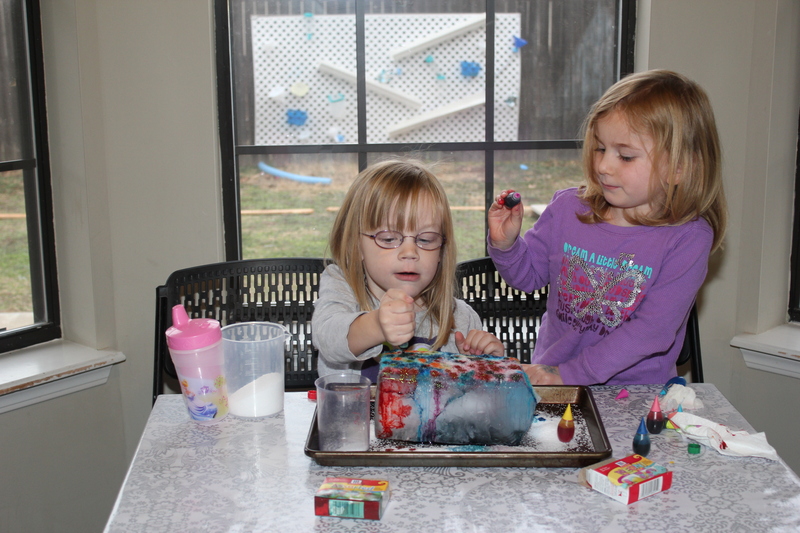 Emerson came over and they got to sprinkle salt and food coloring on a big block of ice to watch it crack and melt. It looked pretty awesome! 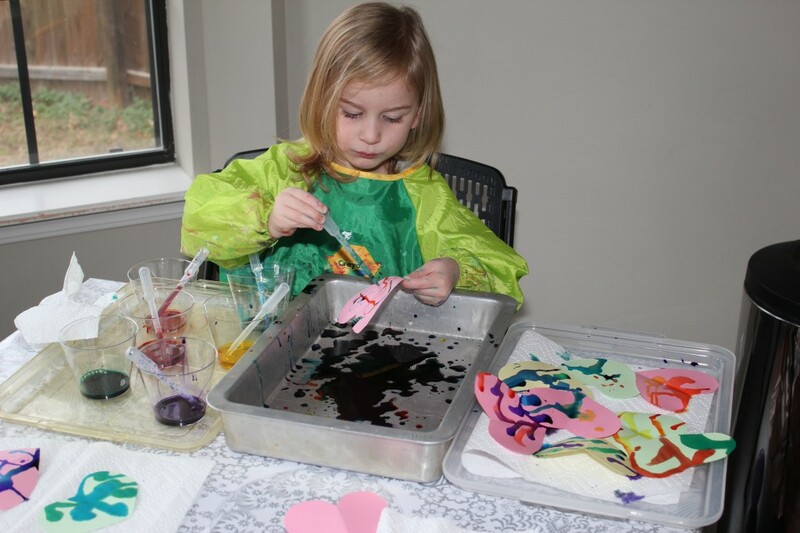 We also did an experiment with oil, water and food coloring that kind of looked like a lava lamp. The second playdate was with Sophia, a friend from school. Her sister came too, and they had a blast together. Donovan followed the big girls around. He called Natalie Alli though, and could not be convinced that all big girls are not called Alli. It’s just like with the boys, he calls basically every boy he wants to play with a Barrett. We started working on Valentines. 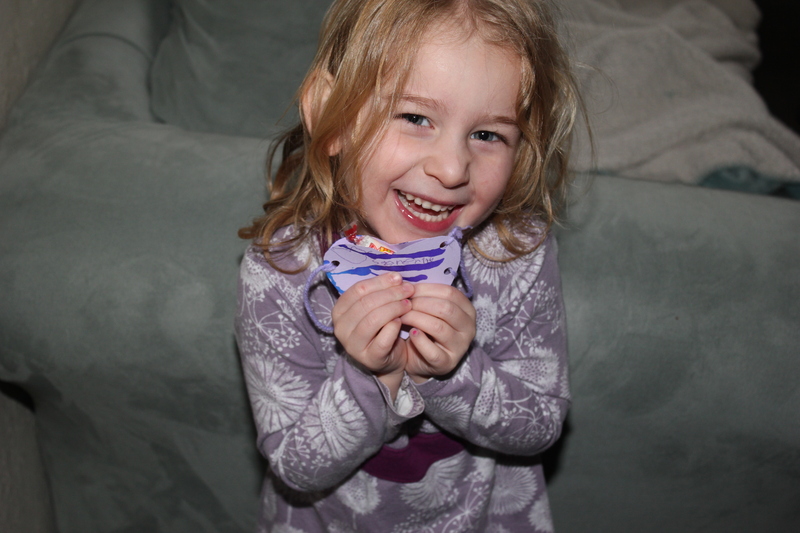 I had pinned several options, and Serenity chose to do a lacing project where you make little heart pouches. She made hers long enough to be a necklace. We made the hearts fancy with puddle painting, and I’ve punched the holes for lacing. 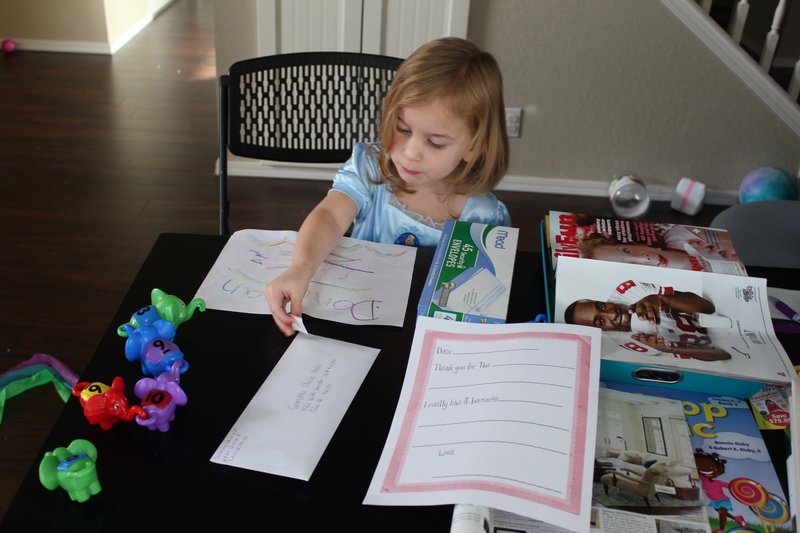 She loves using the hole punch, but the cardstock we used was too heavy for her. So she has to write her name on all but 2 of them, and she has to lace the rest. It’ll get done. 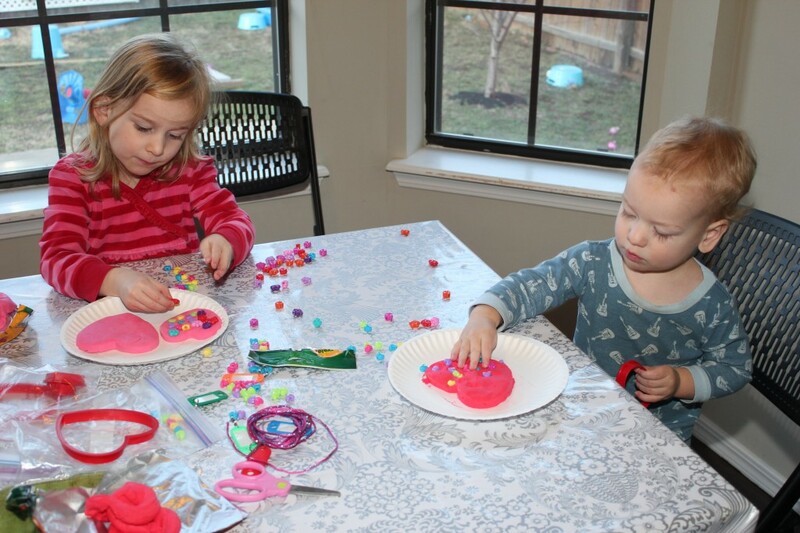 =) We also made clay hearts with Model Magic, and made them mosaics with pony beads. Donovan loved that craft too, it kept them both busy for an hour! One of my plans for this year was to try and do one service-related activity every Friday. I call it Kindness Day, and so far it is a big success! The first week, I had Serenity look through her toys and choose some to donate. I told her to pick one thing from each toy area. 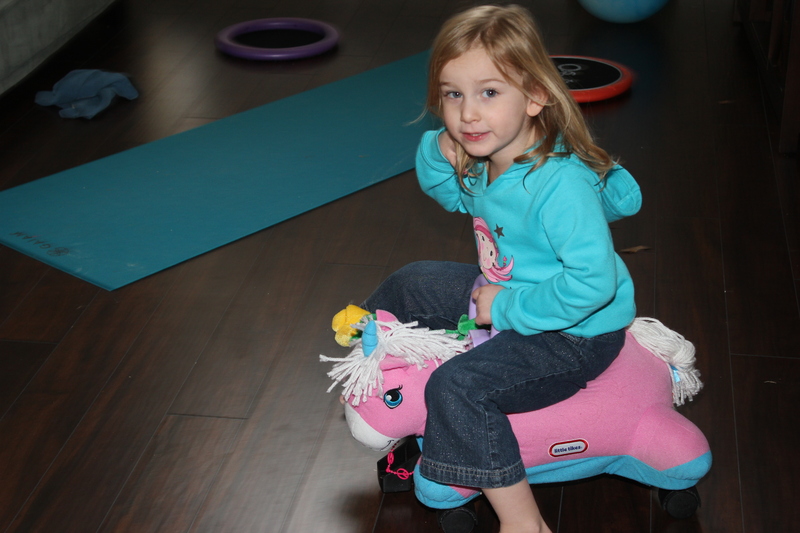 Sometimes she chose things that she had outgrown or was done with, but she also chose a few things she actually likes. I was so proud! Week Two we did thank you notes. I printed off a little page so all she had to do was fill in the blanks. 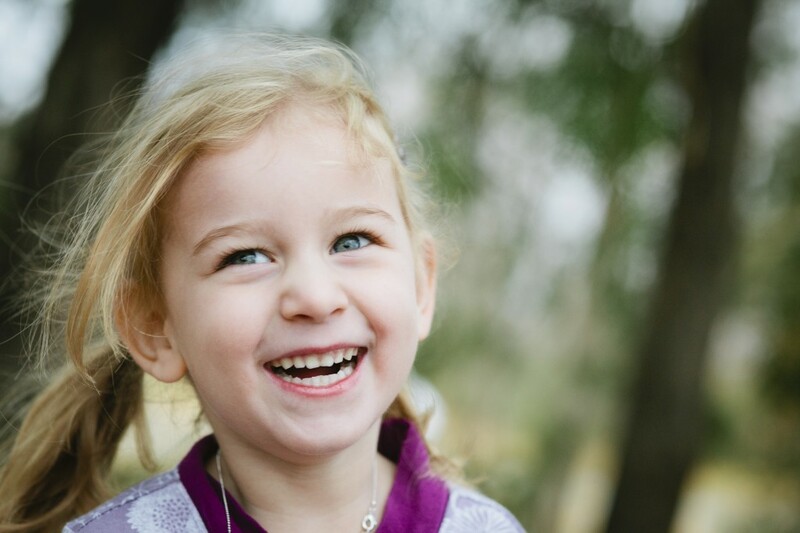 So for each note she wrote the name of the person the note was for, what she got, and then she finished the sentence, “I like it because…” And she signed her name. So it was quite a bit of writing practice in addition to gratitude practice. We also tried to take a picture with each present to send with it. We came down with the flu that weekend, so I’m not sure we got all the thank you notes written, but we got quite a few sent out! Week Three was chosen entirely by Serenity. She was reading over my shoulder as I was looking for ideas for our activity, and she saw a salon gift basket. Probably inspired by the amazing girls day she had with Aunt Jennifer and Raegan, she wanted to make salon baskets for girls at a shelter or hospital. We bought cute buckets and filled them with nail polish, sparkly files, some jewelry, and chapstick. They are super cute, but we haven’t delivered them yet! Week Four was a sewing day. We made cornbags for Grandma and Little Casey. Mom had mentioned to me that she didn’t have a single corn bag, and that little Casey often wished she still had some. I happened to have a little corn left over from the last batch I’d made, so I let Serenity dig into my fabric stash. 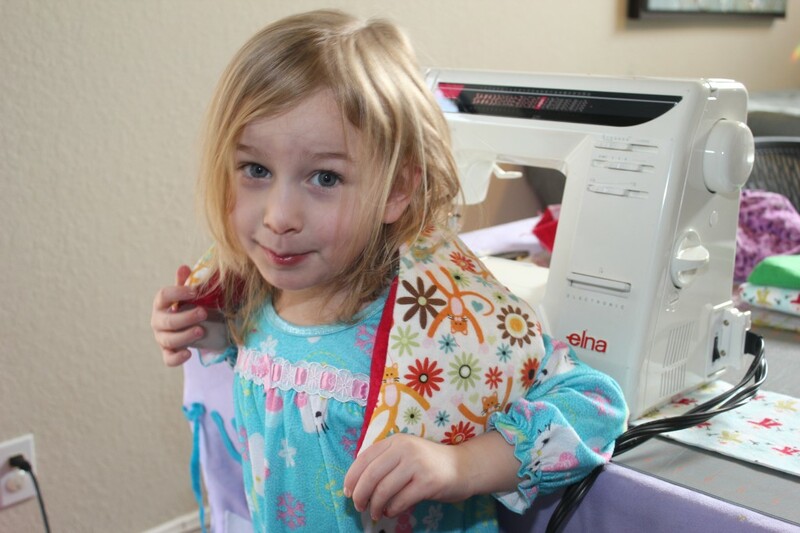 She helped me pin them, she pushed the foot on the sewing machine, and she measured and poured the corn in. They were SO happy to get their cornbags, I think Serenity was absolutely ecstatic!